Pictured above is Jerry Viola, Director of Automotive Technology at ACC and Courtney Loehfelm, the ACC Foundation Executive Director. 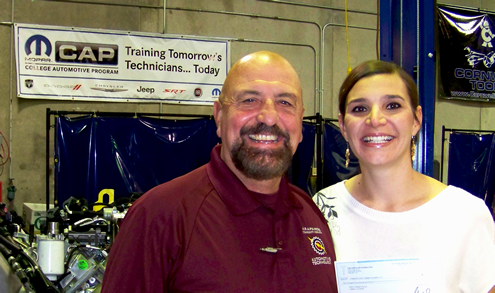 The Arapahoe Community College Automotive Technology Program has received a $3,000 grant from The Chrysler Foundation. The grant is designated to be used for the 2015 Chrysler College Automotive Program (CAP) to purchase shop equipment, computers and storage systems for specialty tools and supplies. Funds may also be allocated for developing curriculum and lesson plans, and to conduct career day recruiting fairs. Previous Previous post: Get your official SkillsUSA member jacket!